Strong supply chains save lives. Strong supply chains are critical to getting health products to clients, wherever and whenever they need them. Supply chain managers have overall responsibility to ensure the continuous supply of health commodities. 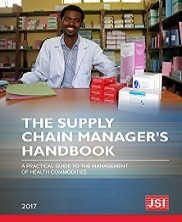 The Supply Chain Manager’s Handbook is the starting point for anyone interested in learning about and understanding the key principles and concepts of supply chain management for health commodities. The concepts described in this handbook will help supply chain managers that are responsible for improving, revising, designing, operating, and monitoring all or part of a supply chain. John Snow, Inc. wrote The Supply Chain Manager’s Handbook based on more than 30 years of experience improving public health supply chains in more than 60 countries. JSI, 2017.